- An interesting first try, but still a ways from perfect. 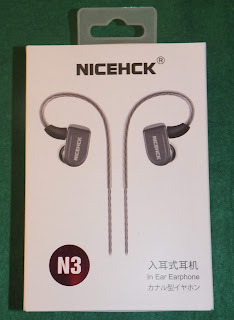 Disclaimer: Jim at NiceHck was kind enough to send the N3 at a substantial discount for review. As with most of my review samples, it will likely go to either the schools or the hospital when the review is completed. This way either it introduces good earphones to the next generation of music lovers (band and choir students) or it goes to someone who can use it to enjoy music and audio books while recovering. 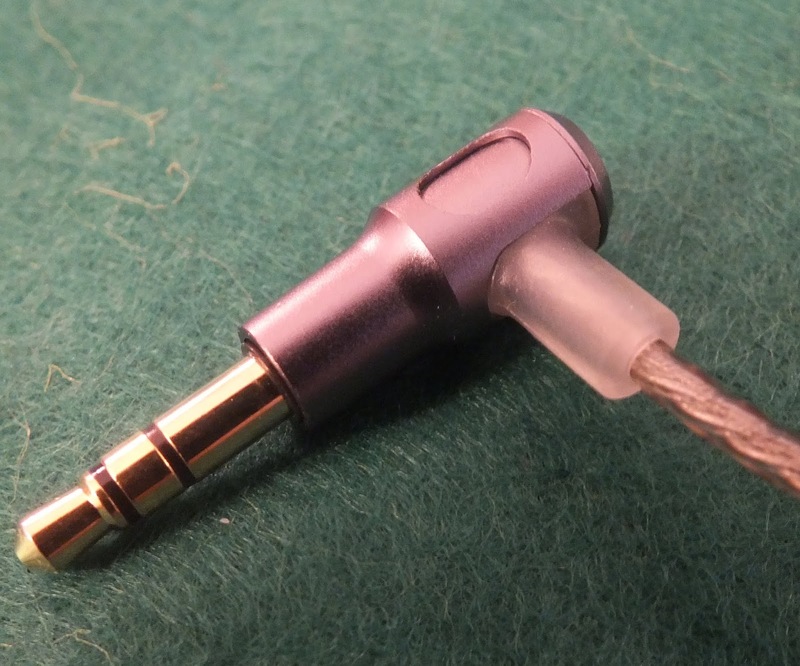 This allows me to review a great many earphones without the questions of conflict of interest that sometimes arise. 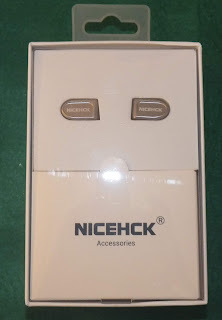 The outer packaging is a slip-cover with an inner paperboard box holding the N3 earpieces in the top 2/3 and hiding the cable and accessories in a box in the lower 1/3. 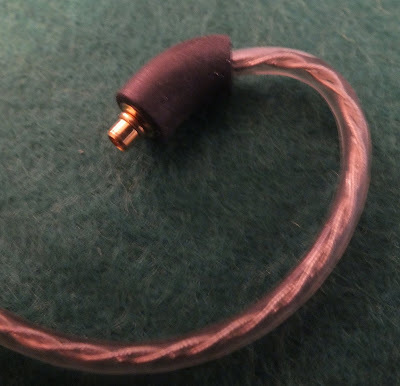 The complete kit consists of the earpieces, three sizes of silicone single flanged tips, the cable, and a cable tie. No shirt clip or case is provided with the N3. The cable provided with the N3 is silver-plated copper in a smoked housing. 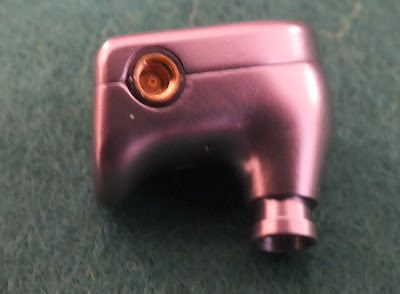 Fitting are gunmetal colored on the jack, splitter, and slider with black MMCX connectors at the upper end. The jack is of the 90º style I find preferable with the a solid metal casing and good strain relief. The splitter is matching metal with NiceHCK imprinted on it and N3 imprinted on the chin-slider immediately above it. 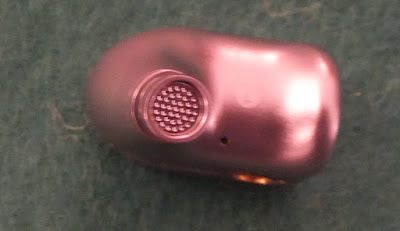 At the north end, the cable does have pre-formed earhooks but does not have a memory wire. 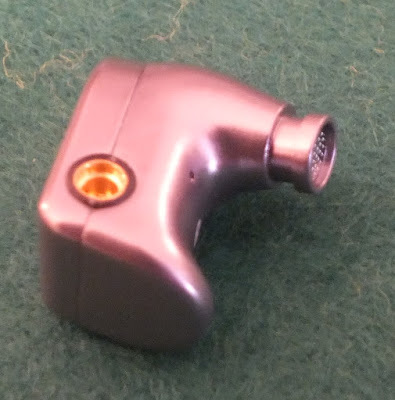 The mmcx housings are thick and sturdy and the connections take some force to make. Overall, I find the cable to be good and much less tangle prone than that which came with the DT6 (my other current piezo review). 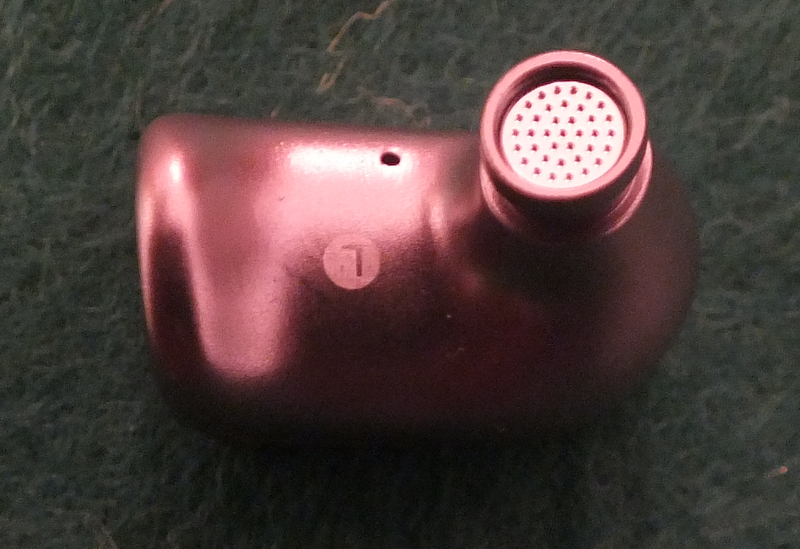 THe N3 has a machined aluminum alloy housing in a bar shape. 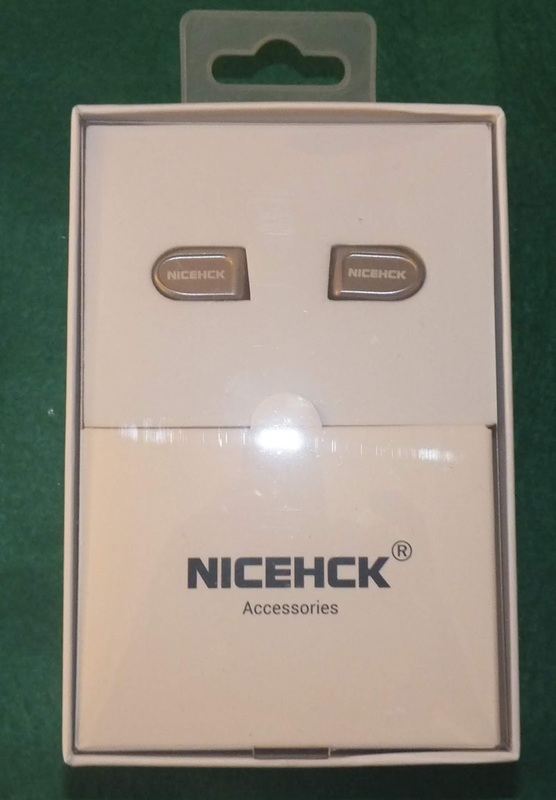 The exterior of each has NickHCK printed in the mid section while the interior of the bar is imprinted with L/R markings although it be impossible to switch the two unless you were going to ear them tip down. Nozzles are straight inward with no forward rake and have a pronounced lip to hold tips in place. 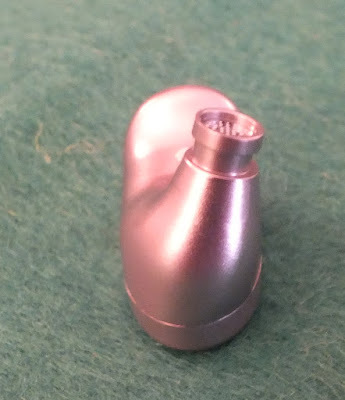 Perhaps the most unique feature is the U shaped interior of the shell which makes it fit very differently than most iems. For me, the rear of the N3 sits at a near 45º angle upward from the lead edge. Forcing the N3 to try and sit flat in the ear is not a comfortable option as the rear arm of the U presses firmly against my ear. I also found that with the vent being in the shallow portion of the U, it is possible to block the vent depending on how these are worn. The N3 uses a dual layer 10mm dynamic driver paired with a piezo-electric driver to handle the upper frequencies. Nominal impedance is listed as 55Ω with a sensitivity of 100dB/mw. As I have found with other in-ears featuring Piezo elements, the N3 needs more power than the specs suggest in order to operate at its best. Coherency suffers as power goes down as the dynamic seems to drop off more rapidly as power decreases than the piezo. With higher power output, the drivers are more nearly the same level and overall transitions between the two are less easily detected. I would recommend not attempting to use the N3 from a smartphone or tablet as neither will be particularly good pairings. I found the xDSD and Xduoo XP-2 both worked well between a phone and the N3 to provide the best results. The N3 is tip sensitive and, for my tastes, ships with tips that do not complement it well. I found the narrow bore tips to push the mid-bass forward, and strengthens an already over-exuberant treble. I found whirlwinds or Spiral-dots worked much better to tone the mid-bass back a bit and give the mids a bit more room to breathe. Treble splash was still present and I suspect the tips did almost nothing to it, but it did allow other things to come closer to meeting it which makes it seem a bit more in balance. Also of note, it was suggested that the N3 needed considerable burn-in (to the tune of 150 hours). I ran the FR both before and after doing that length burn-in and found any differences to be within the expected standard deviation between runs. Take that as you will, but to my ears, it did not change appreciably and the graphs seem to bear out that same observation. Bass extension on the N3 is good, but not exceptional as it drops off rapidly below about 70Hz so anything centered above that sounds good while tones centered below that sound anemic at times. Sub-bass quantity is limited but can be brought forward with some EQ tweaks. Mid-bass is a bit more forward, but also somehow overly clean and not as engaging as expected. The mid-bass is not as well textured or detailed as I would prefer and quite frankly when I had read the specs regarding the carbon nanotube dual driver, I expected better. I know the technology is capable of it, but this particular version is either not tuned to do so, or not designed well. Overall, the lows on the N3 are pretty pedestrian and somewhat forgettable. Mids start out well as the lower mids follow from the bass with a clean transition and show a bit better timbre and detail level. Unfortunately, that takes a turn as you reach into the upper-mids and lower treble where it hits a big spike that makes vocal shouty at times. The problem here is the “at times” as if you tune the mids using EQ you sometimes get better balance, and at other times the vocal disappears behind other things. I found the spike made some vocalists sibilant and others excessively nasal sounding. The same was true for most strings and brass as they came off as either overly aggressive or unnaturally thin. Male vocals present a particularly interesting phenomena where when singing in the lower registers (chest voice) the vocalist appears to be behind other instrumentation, then when they climb into higher registers (head voice) they take a sudden leap forward. 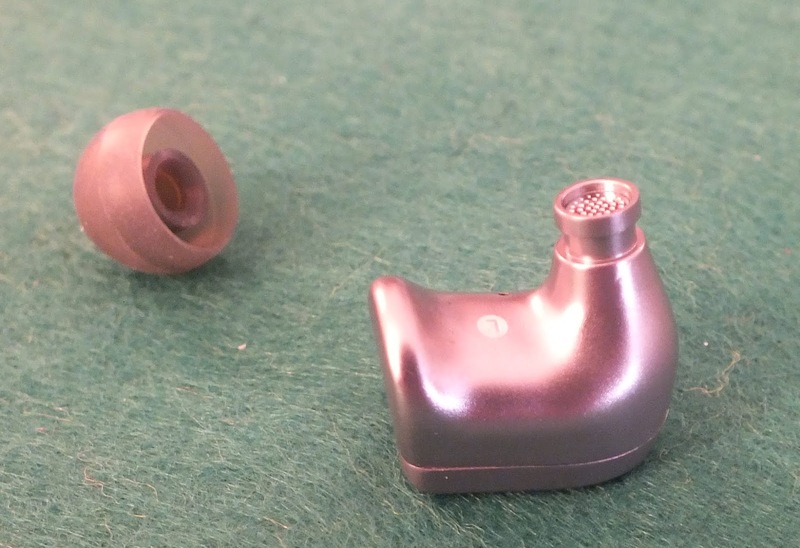 The N3 has the odd distinction of both being too recessed and too forward for vocals. Here again, we have mixed results. The lower treble has a spike that dominates the rest of the treble range and gives the N3 a really unnatural and harsh tone at times. Female vocals that border on sibilant anyway, will go into full fledged ear-shredding mode and cymbals become indistinguishable if played quickly as the hits all run together instead of being distinct. To make matters worse, decay of the lower treble is slow so those harsh factors extend out and tend to have a linger impact. As we move above the spike, the upper treble first takes a nosedive and produces a considerable trough at about the 7kHz mark. Some energy is brought back at about the 12kHz mark which helps give the N3 some air at the top end which would otherwise be lacking. Again, depending on which range the upper harmonics fall into, an instrument may show air and sparkle, or it may fall dead flat to the ground depending on whether it hits the peak or the trough. Soundstage may be the single best thing about the N3. It is slightly wider than deep, but has good dimensions both ways and gives a very open feel in the overall. Things like the Cowboy Junkies Trinity sessions really highlight the depth and width of stage and are indeed impressive. Layering and imaging are also a mixed bag. With most tracks, instrument separation is good and lends to easy placement of instruments on the stage. As tracks get really busy, the N3 becomes overwhelmed and the imaging falls apart. The N3 seems like a lot of experiments in one package. Shape is the first and is a mixed result. For some it is comfortable, for others the lip at the rear pushes against the ear and makes long wear uncomfortable. The Piezo-electric driver is another experiment, and another mixed result. Whether the spikes are inherent to the drivers used or a product of the combination of drivers, crossover components, and housings remains to be identified. It would not surprise me if the 2kHz spike was a resonance between the piezo and the housing while the 4kHz seems more likely to be inherent to the driver itself. Either way, these unfortunately overshadow the occasional flash of something good underneath. My hope is that NiceHCK will take what they have learned with the N3 and move forward to produce an N4 and N5 that move the state of the design forward and into territory where it can be recommended as I do think it shows a lot of potential. Pros: Good build quality, peizo treble is well behaved and may hint of things to come.